Four classes of antibacterial agents that operate by inhibition of the Type II topoisomerases, DNA gyrase and Topoisomerase IV, have progressed at least through Phase 2 clinical trials. Compounds from each of the four classes are not cross-resistant to one another as determined by analyses with laboratory and clinical resistant bacterial strains. Hence, they are defined herein as sharing a mode of action, in that they inhibit the same targets, but differing in mode of inhibition, in that they obstruct enzyme activity via divergent binding modes. Two of the classes, fluoroquinolones and aminocoumarins, were long ago approved for clinical use, though the use of the latter has been limited. Two newer classes, spiropyrimidinetriones and quinolines, are represented by the advanced drug candidates zoliflodacin and gepotidacin, each featuring a novel scaffold and a distinct binding motif. X-ray crystallography has shown fluoroquinolone and spiropyrimidinetrione binding at DNA cleavage sites of the topoisomerases. However, the two differ by their dependence on [Mg2+] for binding serving in part to explain the lack of cross-resistance. Quinolines bind to DNA-topoisomerase complexes offset from the cleavage sites as ascertained by X-ray crystallography. Novobiocin, the only aminocoumarin to receive regulatory approval, competes with ATP binding at a site quite remote from the DNA-binding domain. As novobiocin has been withdrawn from the clinic, considerable drug discovery efforts have focused on alternative ATP site binders (ATPase inhibitors). With widespread use of fluoroquinolones leading to resistance, the importance of developing novel antibiotics that would not be cross-resistant is clear. 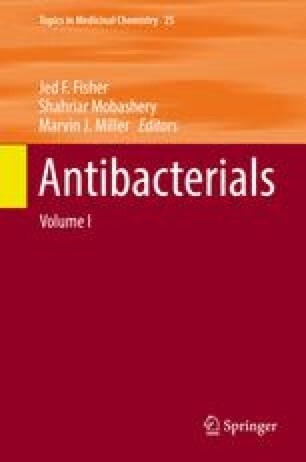 Reviewed herein are the current understandings of the respective mechanisms of inhibition and the respective topoisomerase binding modes for the four classes of antibacterials now with clinical proof of concept. Considerable appreciation is due to Dr. Charles J. Eyermann for useful discussions and for the preparation of the graphics in this review. Dr. Ed Buurman graciously provided a critical review and helpful suggestions.